Over hundred of passengers on Sunday protested various irregularities in inland water transportation ahead of Eid and demanded safe and standard water vessels service. 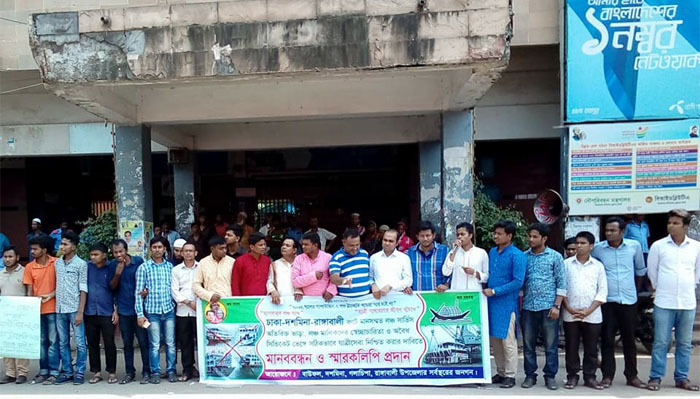 The protesters announced their demands from a human chain formed along the VIP gate of Sadarghat terminal under banner of the general passenger of Dhaka-Rangabali-Bauphal- Dasmina route. The passengers’ body also submitted a memorandum to Bangladesh Inland Waterways Authority (BIWTA). Speakers at the programme said this year the BIWTA authorities allotted unfit and smaller size launches on Dhaka-Rangabali-Dasmina route which will eventually make passengers victim of suffering of and accidents. Apart from that owners run launch service on their whim during the Eid trip and charge extra from passengers, they alleged. They also demanded proper actions against the dishonest syndicate to end their terror and evil rules in the waterways. Nizam Uddin organizer of the human chain said, usually in our route number of passengers is higher than the capacity of water vessels that authorities fix for the route. Like the past tragedies, we want don’t want to experience the same thing again. If unfit vessels including Jamal-3, Koko-5, Srinagar-2 are not removed our route if would not shift from our position, another organizer Obydul Islam also an Awami Leader. . Passengers from Patuakhlai district were present at the programme.